The 17th Annual 2010 ESPY Awards were hosted in LA last night, honoring the best performances in sports throughout the past year. The ESPYs (standing for Excellence in Sports Performance Yearly) are hosted by ESPN and are made to model the Grammys, Acadamy Awards, and other award shows similar to them. Live from the Nokia Theater in downtown LA, the 2010 ESPYs, hosted by Seth Meyers. 9:04pm: Intro: "Go out and play hard, because you're not promised tomorrow." 9:05pm: In loving memory: RIP Yeardley Love, Bob Probert, Ernie Harwell, Bob Sheppard, George Steinbrenner, John Wooden and all of the other great athletes and athletic greats that have passed on this year. 9:10pm: "The ESPY's are live tonight, so I'm going to take a minute to explain what that means. If anyone uses inappropriate language, the people at home will hear it. Shaun White, I am talking to you." Shaun White, I am now talking to you, and you need a haircut. 9:10pm: "Look at all the athletes here... Landon Donovan, Mark Sanchez, Reggie Bush... all the guys on your girlfriend's 'exception list'." He's right; Reggie Bush has always been on my exception list. 9:11pm: "The Saints proved that the underdog team can win a championship, unless that team is playing the Yankees, the Lakers, or Duke." Blue Devils baby. 9:12pm: Best dressed so far: Erin Andrews. 9:13pm: "You guys have the word leave in your name: Ca-leave-land. You guys need to have a town meeting tonight and change it to Ca-stay-land." 9:14pm: "But we all know which free-agent is making the most money this summer: Elin Nordegren." In the words of Taylor Martin, thatta girl, Elin. 9:16pm: "Tonight is a night when sports and entertainment come together; it's like a Kardashian sister's bedroom." I love the Kardashians to pieces but well played, Seth Meyers, well played. 9:19pm: Why is Zac Efron at the ESPY's? As much as I adore the High School Musical trilogy, that basketball dance sequence does not count as athletics. 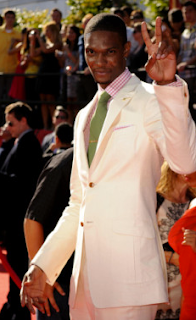 9:20pm: Miami Heat player Chris Bosh (what a goofy-looking dude) and supermodel Marissa Miller (dressed to kill) present the award for "Best Breakthrough Athlete". I was all kinds of off on this one; I promise I'll get better. I have a soft spot for John Wall, but Chris Johnson is definitely deserving. 9:35pm: Olympic gold medalists Lindsay Vonn and Shaun White (is she really tall or is he really short?) present the award for "Best Record-Breaking Performance". Duh. 11-hour tennis match? Federer, you didn't have a prayer. 9:45pm: Oh hey, Mark Ingram and Sloan from Entourage are here. Which one doesn't belong? 9:50pm: Jim Joyce and Armando Galarraga on stage together, presenting the award for "Best Moment in Sports". Galarraga is such a class act, represent Detroit! No brainer as well - the World Cup just ended and everyone is still high from vuvuzela buzzing. 9:56pm: Congratulations to the Duke Blue Devils for their championships in Men's Basketball and Lacrosse. 10:01pm: Vince Young and Tim Tebow introducing together? That's a joke, right? Tebow's a crybaby, Team Vince. 10:02pm: Actress Ashley Greene and comedian Tracy Morgan present the award for "Best Upset". Lauren. Caisman. Everyone made fun of my roommate for her Northern Iowa pick over Kansas during March Madness last year, but her bracket dominated because of it. Awesome, awesome game. 10:12pm: So that's why Zac Efron is here, presenting the award for "Best US Male Olympian" with actress January Jones. Shaun White also won Best Male Action Sport Athlete. He's pretty impressive, I'll give him that, and he's a serious crowd pleaser. He still needs a haircut. 10:20pm: Brett Favre presents the Arthur Ashe Award for Courage to Iowa Falcon's football coach from 1975-2009, Ed Thomas. What an unbelievable story and what a deserving man. Even though this doesn't do him a remote amount of justice, read more about the story here. 10:44pm: "Don't get honey on your vuvuzela." "That's what she said." "You know you're only average at blowing that thing." 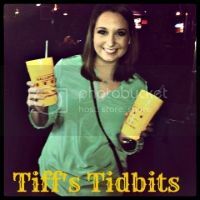 "That's what she said." Girl rocked the Olympics, sorry Serena. Olympics > Wimbledon. 10:59pm: Sports Illustrated cover model Brooklyn Decker and actor John Hamm present the award for "Best Play". I used to love Favre (hence my vote). I hate him now after all of his LeBron-esque drama, but a lot of people still love him (hence my prediction). Oh, and the guy can play football. 11:17pm: NASCAR's Danica Patrick and actor Luke Wilson present the award for "Best Male Athlete". What? So happy that it's not LeBron, but also extremely surprised that it's not him or Kobe. Whatever, it's not LeBron. Congrats, Drew. 11:22pm: Kenny Chesney presents the award for "Best Team". Voted with my heart and chose the Crimson Tide, but obviously the comeback story of the year is going to win. Congratulations to the New Orleans Saints on a phenomenal season and a Superbowl win. Yes, yes, yes. Can't say enough about this movie. Perfect. All very well-deserved awards. Okay, you won a Superbowl. I still say it was Woodson's (I'm also really biased, obviously). I can't think of another athlete I despise as much as I despise Sidney Crosby. Diehard Ryan Miller. Obviously would have loved to see fellow Michigan native and Crimson Tide player Mark Ingram win it, but my soft spot for John Wall is too big to care. The ESPYs were a huge success, and in my opinion, much more entertaining than any recent award show I've watched. And where there's an award show, there's a red carpet. You can look at the entire collection of red carpet shots here (be forewarned, Zac Efron is in about 200 of the 500, looking like somewhat of an idiot), but I've picked a decent amount to showcase the ESPY fashion, starting with the best and ending with the rest. Enjoy! ESPN host Erin Andrews with wide receiver Terrell Owens. While I don't particularly care so much for his ensemble, Erin looks stunning and is wearing my favorite outfit of the night. Melissa Miller is a close second in this barely-there black dress. 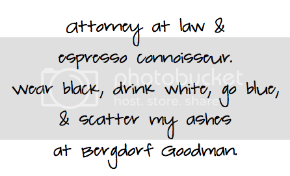 As Bill Simmons put it: "And on Sunday, God created Brooklyn Decker." NASCAR driver Danica Patrick turned heads in her blue and black with waves that no one ever gets to see out of the helmet. Mark Ingram looking as handsome as ever. 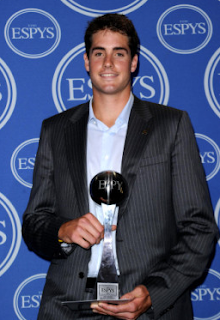 John Isner looked amazing at the ESPYs. By amazing, I mean incredibly hot. Landon Donovan and wife Bianca both came dressed to impress. Even though Sloan has horrible posture, I promise she didn't stand like this all night and Emmanuelle Chirqui looked gorgeous as usual. Zac Efron: are you attractive? Absolutely. Do you still look like a massive tool in this + the 200 other photos of you on the red carpet? Without a doubt. 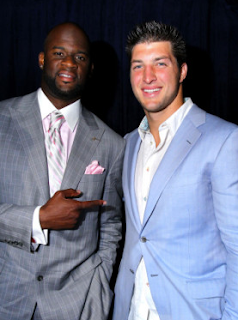 Vince Young looks incredible in his suit and Tim Tebow looks like he just left an SAE-themed frat mixer. Vince 1, Tim 0. Mark Wahlberg rocking the red carpet. Love you Ryan Miller, but you aren't impressing me all that much. Neither is your actress girlfriend. 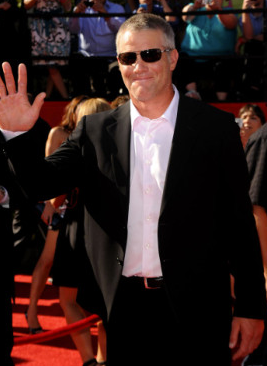 Favre, you could have at least put on a tie. With muscles like hers, Dara Torres should probably not be wearing this kind of dress (although I will say that it's really pretty). Lindsay Vonn: you're so pretty, so why choose a not-so-pretty gown to wear? That's the other thing: do you really need to wear a gown to the ESPYs? Kendra Wilkinson and Hank Baskett pose for the cameras. What is with the hat, Hank? Ashley Greene is blending right in with the red carpet in this dress. Not her best look, to say the least. Just thought I'd throw this in there for good measure. Alan Thicke, what the hell are you doing here? A. Chris Bosh is a legitimate goon. Look at him. B. Who told him it was okay to walk outside like that? 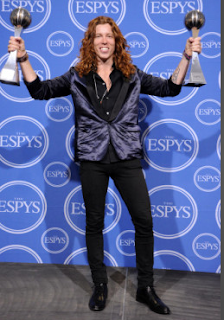 And it pretty much goes without saying that my worst dressed vote of the evening goes to Shaun White. What do you even say about this? Congratulations to all the ESPY winners and to everyone who was nominated. The evening was a great success and I'm already looking forward to next year's! Thanks Grant! Glad you enjoyed it. hahaha jamie, this was hilarious and totally true. Thanks MK! You're the best. Glad everyone liked it!